The Vassar Haiti Project partners with over 25 community leaders in Chermaitre, Haiti to make our work possible. These leaders range from a doctor to school teachers to a water technician. Our partners are the backbone of our initiatives guiding how VHP works and where it will go next. Pere Andre Wildaine is the priest in charge representative of the Partnership Program to Chermaitre and several neighboring villages. The Partnership Program is an extension of the Episcopal Diocese of Haiti, which is based in Port au Prince. We chose to work through the Episcopal Diocese on the recommendation of many that they were an organization with a high degree of financial integrity, and also one that placed good people in charge of village projects.Pere Wildaine was Deacon under Pere Soner for a number of years, and was in March promoted for his hard work and was assigned to several villages. 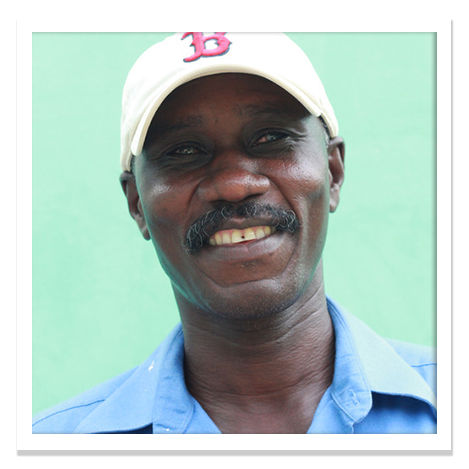 His role in Chermaitre and the other villages in which he works is work with our organization toward making positive impact in the areas of education, health, reforestation, water access and purification, and a women’s cooperative. Our mutual goal is to foster sustainable development in Chermaitre. For Clairvoix, founder and director of Ecole St. Paul in Chermaitre, education is a lifelong passion and commitment. He oversees the operations of the school, which follows a government-recommended curriculum from kindergarten through 6th grade. Hailing from Port-au-Prince, Haiti, Dr. Gueslin Joassainvil is the primary doctor at the Chermaitre-Fiervil Health Center. He became our partner in October 2013 and has been the medical director of the Health Center since. At our current capacity, he opens the clinic for two days twice a month. With the help of the nurses, Dr. Joassainvil sees more than 50 patients each day, providing consults as well as prescription medication when necessary. He speaks English, French, and Creole. Nurse Amoly assists Dr. Gueslin in the clinic through his work in the pharmacy. He distributes medications from the on-site pharmacy and keeps an inventory of the medications. He staffs the clinic every day with the help of Nurse Junie. Together, they rotate in making trips to the school in Chermaitre, promoting health education among the students. Nurse Junie does patient intake at the clinic, assisting Dr. Gueslin. She takes the patient’s vitals, as well as helps to organize patient records and register new patients. She staffs the clinic every day with the help of Nurse Amoly. Together, they rotate in making trips to the school in Chermaitre, promoting health education among the students. Peter Lylord is an academically gifted medical student studying to become a neurosurgeon (there are currently only four in Haiti). He shines in his many roles as invaluable partner, friend, guide, and translator to VHP, and has led our team in carrying out clinic services in Chermaitre. He is passionate about bettering the health of all Haitians regardless of class or background. He says, "VHP is the greatest opportunity that I have given in order to help the needy ones more and more in Haiti." Marie Vierge is the village matron. 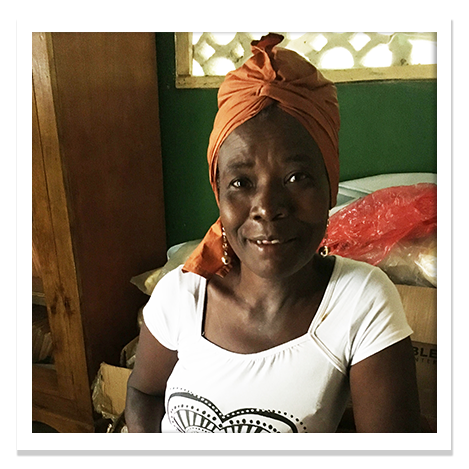 Trained as a midwife at Alma Mater hospital in Gros-Morne, the nearest city, she used to be supported by the staff there. However, after the earthquake, their support ceased. She perseveres on in her work because she believes in the importance of helping other mothers. Benoit is the president of the Femmes de Chermaitre women’s cooperative. The cooperative provides an empowering environment for the women of Chermaitre to take on projects to supplement their income. As an artist, Benoit teaches them new skills to take on in the project-making process. The women now make jewelry, napkins and coffee.